Happy New Year! I hope you have all had a great holiday. 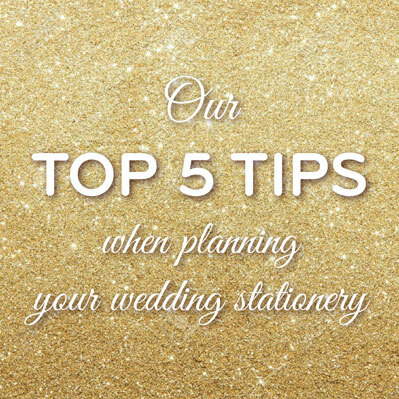 To get things started for 2016 we thought we would give you our top 5 tips of things to consider when you are planning and arranging your wedding stationery. We hope they help. Your invitation gives your guests the first exciting glance in to the the theme of your wedding day and the style you are setting. It not only gives them the essential details of your day, such as date, time etc but it sets the tone of the day, whether it is classic and elegant or relaxed and modern. There are so many styles of stationery you can go for. We suggest gathering lots of inspiration together so you can give a clear idea of what you are looking for when it comes to your wedding stationery. Before your wedding stationery order is printed you will receive a proof on email. This is your chance to check all the details are correct. What ever you do don’t just check it yourself, ask someone else to check through the details before you give the go ahead to print. Check the obvious things like your names, date, time and spellings. You will be surprised what you can miss! Take a tip from professional proof readers by reading every word from right to left so you don’t gloss over any potential mistakes. Save yourself time and effort by asking your stationer to personalise each invitation with your guest’s names. All you will need to do is supply a list or spreadsheet of the names as you would like them printing and they will do the rest. You could even ask if you could have your envelopes printing. By doing this each invitation looks highly finished and it frees up your time to do some more planning. Before you confirm the number of wedding invitations you need take a look at how many couples or families you are inviting. There is no need to send an invitation to every guest, just send one to each household. It is always advisable to order a few extra though just in case you have any last minute changes. Ordering your day stationery items such as order of the day, menus, place cards and table plan in the same design as your wedding invitations will ensure your theme is carried through the whole of your wedding day. Don’t forget the thank you cards too! This is a lovely way to remind your guests of your wonderful day and to thank them for being such an important part of it. Previous post: To theme or not to theme!